As you know, there's always lots of construction going on at Penn. Here's a real gem for you. You've walked on it a million times and most probably even tripped on one of its crooked bricks, but did you know what Locust Walk was built on top of? 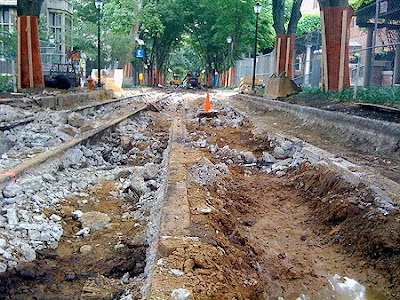 Recently, Locust Walk has been torn apart to reveal an old trolley tracks! 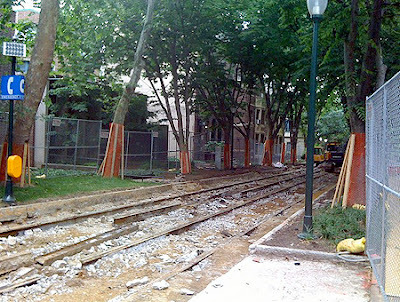 Check out another picture of the torn up walk after the jump and learn more about the history of these Trolley tracks on campus! "Philadelphia has one of the oldest streetcar systems in the nation, and for decades these trolleys were a dynamic part of the Penn experience. 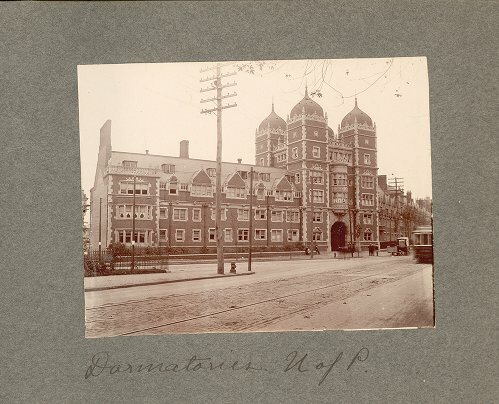 The Philadelphia Rapid Transit Company, a precursor to SEPTA, operated streetcars on Woodland Avenue through the heart of campus, directly to 30th Street Station. Generations of Penn students have memories of trolleys crisscrossing the campus, steel wheels rattling along on their tracks, the ever-present bells clanging away. 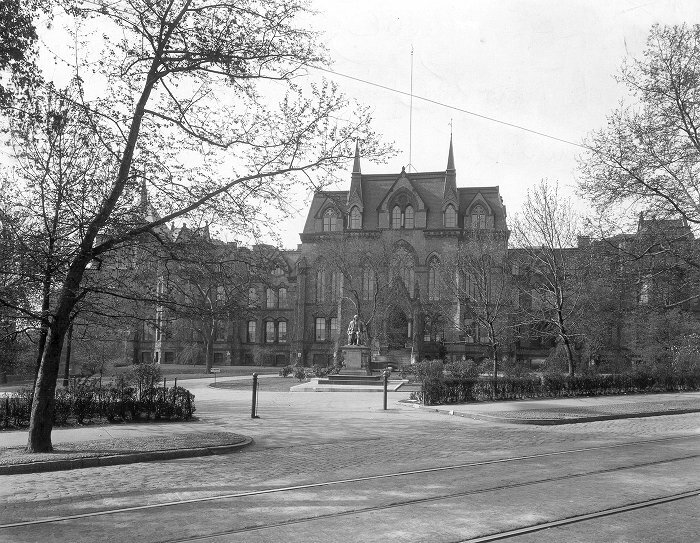 In 1956, the tracks were submerged at the edge of campus to facilitate a comprehensive campus plan that created a core campus between 34th and 38th streets and Walnut and Spruce streets, uniting buildings and pathways and enhancing the pedestrian experience. A landscape plan added trees, pathways, parks and opens space. Thank you to Joanne Murray (Assistant Dean of Annenberg School) for sending in the tip about the 2 photos above!